I found an old sketchbook while cleaning out my place. 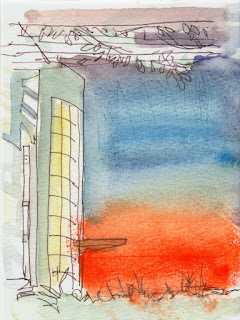 It is Handbook panorama sketchbook with watercolor paper, and I had a few sketches in it and the rest was blank. Remembering that I didn't like the way watercolor behaved on this sketchbook, I still decided to use it again. This time around, I really enjoyed how watercolor flows on the page. 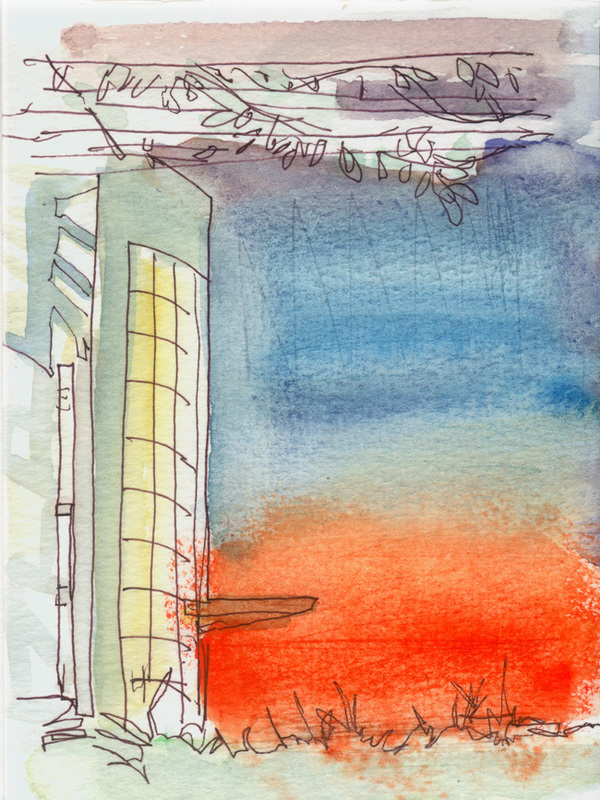 By coincidence, the first watercolor I did and the last watercolor I did in this sketchbook were of the same place (The Getty Center), around the same time (sunset in autumn), and done with the same waterbrush (Sakura Koi waterbrush). I remember facing the same limitations with using a waterbrush: I scraped the sky with plastic body of the brush in the first sketch in my effort get a large wash in the blue sky area, and I still had a hard time getting a large wash in the second sketch. Even with these restrictions, I think I made improvements in getting the value and got better at letting watercolor work its magic. It's amazing what four years of daily sketching can do, even when I am not aware of how I am progressing when I look at my sketches from day to day. Here's to more sketching in 2016, and my your new year filled with art!